Boxing Insider Notebook: Lara, Hurd, Imam, Ramirez, Top Rank, ESPN, and more…. The following is the Boxing Insider notebook for the week of March 6th to March 13th; covering the comings and goings in the sport of boxing that you might have missed. Erislandy Lara, the longest reigning world champion at 154-pounds, will clash with IBF champion “Swift” Jarrett Hurd in a highly-anticipated super welterweight title unification live on SHOWTIME (10 pm ET/7 pm PT) as part of an exciting card presented by Premier Boxing Champions Saturday, April 7 from The Joint at Hard Rock Hotel and Casino in Las Vegas. In the co-main event, Super Middleweight World Champion Caleb Truax will make the first defense of his IBF title against James DeGale in a rematch of one of the biggest upsets of 2017 that saw Truax wrestle the belt from DeGale on his home turf in London last December. Tickets for the show, which is promoted by TGB Promotions and Mayweather Promotions, will go on sale Friday, March 16 and be available by visiting AXS.com or the Hard Rock Hotel & Casino, Las Vegas Box Office. “We take pride in promoting quality events that our audiences always want to see,” said Leonard Ellerbe, CEO of Mayweather Promotions. “This card is going to be another line-up that the fans won’t want to miss. With Lara and Hurd looking to unify their titles and guys going head-to-head in rematches on the undercard, this is sure to be a night of non-stop action. Lara vs. Hurd is a classic contrast in styles that could force each fighter to raise their game to another level. Lara is a crafty southpaw who relies on his superior boxing skills to confound opponents, while Hurd is a pure pressure boxer-puncher that stalks his opponents and isn’t easily frustrated. Lara, a Cuban whose nickname is “The American Dream”, is coming off a unanimous decision victory on SHOWTIME over Terrell Gausha in October. Hurd was on the same card and defeated former champion Austin Trout when Trout’s corner stopped the fight in the 10th round. That paved the way for this unification showdown. 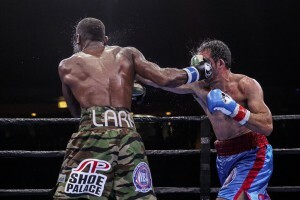 The 34-year-old Lara (25-2-2, 14 KOs), who lives and trains in Houston, Texas, won his world title with a TKO victory over Alfredo Angulo in 2013 and has successfully defended it seven times, which includes wins over Trout, Ishe Smith and Vanes Martirosyan. The undefeated Hurd (21-0, 15 KOs) is coming off a career-defining TKO victory over the former champion Trout in his last fight on Oct. 14. It was the first defense of the title for the 27-year Hurd of Accokeek, Maryland, who won the championship with a TKO victory over Tony Harrison on Feb. 25, 2017. “I plan on being the aggressor for the entire fight, so I’ve been doing some exercises and working on techniques to improve my foot work so that I can stay on top of Erislandy Lara,” said Hurd. “We are not trying to go to the scorecards, so hopefully, I can be the first man to stop him, which I hope to do in the later rounds. They call 34-year-old Truax “Golden”, and he punched his ticket to world title gold while on a trip to London in December, when he defeated DeGale by majority decision. Truax (29-3-2, 18 KOs) of Osseo, Minnesota was on a two-fight win streak heading into the match against DeGale. Before that his only losses came against former champions Anthony Dirrell, Daniel Jacobs and Jermain Taylor. The 32-year-old DeGale (23-2-1, 14 KOs) was the first British boxer to win a Gold Medal in the Olympics (2008 Beijing Games) and a world championship as a professional. He won his world title with a unanimous decision over Andre Dirrell in 2015 and made two successful defenses before fighting to a draw against Badou Jack on Jan. 14, 2017. It was a brutal standoff between two world champions, but neither man had his hand raised in victory. DeGale, who was coming off of an injury, had his home town crowd behind him but couldn’t deliver a win as Truax scored a stunning upset with the majority decision victory. Amir Imam (21-1, 18 KOs) is in Pompano Beach, Florida, under the auspices of head trainer Stacy McKinley, in final preparations for his March 17 showdown against Jose Ramirez (21-0, 16 KOs) from Avenal, California for the vacant World Boxing Council (WBC) super lightweight belt Saturday, March 17, at the The Hulu Theater at Madison Square Garden. “Amir Imam is coming to Madison Square Garden, The Mecca of Boxing, in New York City, to take down not only Jose Ramirez but Bob Arum too!” boasted Imam’s promoter Don King. “I can hardly wait for Saturday night. Start the clock. Tick-tock, tick-tock.” T-minus 124 hours 45 minutes till Ramirez-Imam enter the ring, Saturday night . . .
“Yes sir, March 17 is a big day for me and the stakes are real high for both me and him. It’s the first time I get to fight in the Garden and that’s exciting, knowing that greatness has fought there. It’s the first time I am fighting in a main event and first time fighting for a world title,” said Imam. “It’s what I have been working for my whole life and it’s finally here and I’ve got to take advantage of it. Ramírez vs. Imam will headline a spectacular St. Patrick’s Day boxing extravaganza, The Ramírez – Imam world championship fight will be televised live and exclusively at 8 p.m. EDT on ESPN and stream live on the ESPN App at 6 p.m. EDT. It will mark the first time Arum and King have battled each other promotionally on the same card since Miguel Cotto defended his World Boxing Association (WBA) super welterweight world title on March 12, 2011. Top Rank on ESPN saw Oscar Valdez (24-0, 19 KOs) retain his WBO featherweight title against Scott Quigg while fighting under a canopy at the rainy StubHub Center, the famed outdoor boxing venue in Carson, Calif. south of downtown Los Angeles. The telecast includes two of 2018’s top five highest-rated fights on cable television in 2018, according to preliminary audience results from Nielsen. The Valdez vs. Quigg world championship fight aired live and exclusively on ESPN and ESPN Deportes and streamed live on the ESPN App. The next Top Rank on ESPN is this Saturday, March 17 and features top-rated contenders José Ramírez and Amir “Young Man” Imam fighting for the vacant World Boxing Council (WBC) super lightweight world title. Ramirez vs. Imam will headline a St. Patrick’s Day at The Hulu Theater at Madison Square Garden. The event also features Irish Olympian Michael Conlan (5-0, 4 KO’s), from Belfast, who begins his sophomore professional year exactly where he started his freshman year — at The Garden. The Ramirez vs. Imam world championship event will live and exclusively at 8 p.m. ET on ESPN and stream live on the ESPN App at 6 p.m. ET. Chazz Witherspoon raised his winning streak to eight in a row as he went the eight-round distance by won a unanimous decision over Lamont Capers that headlined a seven-bout card at The Claridge Hotel in Atlantic City. The show, which took place this past Saturday, was promoted by Mis Downing Promotions and Silverspoon Promotions. Witherspoon was able to outpoint the crafty Capers. Capers was very competitive, but it was Witherspoon’s size and harder punches that proved to be the difference as he captured the via 78-74, 78-74 and 77-75 scores. Witherspoon of Paulsboro, NJ is now 37-3. Capers, who was fighting for the 2nd time in seven days is 9-12-4. Willis Lockett took a six-round majority decision over Prince Badi Ajamu in a cruiserweight bout. Lockett of Takoma Park, MD won by scores of 59-55, 58-56 and 57-57, and is now 16-22-6. Ajamu of Camden, NJ is 28-4-1. Super Lightweight John Bauza remained undefeated with a six-round unanimous decision over David Morales. Bauza of North Bergen, NJ won on all cards by scores of 60-54, and is now 9-0. Morales of Managua, Nicaragua is 13-9. Mike Hilton won a three-round technical unanimous decision over Hector Perez. The fight was a terrific back and forth brawl when Perez suffered a cut over his right eye in the third frame. Perez almost made a quick night for himself as he dropped Hilton in the 1st round. Hilton stormed back to register his own knockdown’s in round two and three. The scores were 28-26 on all cards at the time of the stoppage. Edgar Cortes won a four-round unanimous decision over Kevin Asmat in a featherweight bout. Scores were 38-37 twice and 39-36 for Cortes, of Vineland, NJ, who is now 6-4. Asmat of North Bergen. NJ is 3-2. Alejandro Jimenez made a successful pro debut with a 2nd round stoppage over Derrick Pitts in a bantamweight bout. The time of the finish was 3:00. Pitts is 0-2. Dan Murray and Latorrie Woodberry fought to a no-contest when Woodberry hurt his shoulder in the 1st round of their scheduled four-round welterweight bout.